Every year the Milan Furniture Fair heralds a tidal wave of new concepts and products, the sum of which allows trend researchers to spot patterns for the year ahead. Mariel Brown and Karen Rosenkranz from Seymourpowell filter through this seismic swell of the new and uncover the standout projects that they believe will set the design mood for 2014. Our increasingly digital lives can feel very predictable; big data is anticipating our needs before we know them ourselves, and geo-location services are making getting lost virtually impossible. All this certainty makes us crave a little uncertainty. We desire surprise, magic, and wonder. Excitingly, Japanese design studio YOY gave visitors to Milan exactly that with their latest collection of designs that play with illusion and ‘bring humour to an ordinary room’. Our particular favourites from the collection were Protrude, a tray that looks as though it’s about to fall yet doesn’t, and Light, a table lamp and floor lamp which project their shade on to a nearby surface. The design duo’s theme is ‘to create a new story between space and objects’ and we anticipate that many more designers will explore stories of illusion in the coming year. The role of the young designer in Milan increasingly seems to be to challenge the norms of the design establishment rather than aiming to become a part of it. This year we were pleased to discover recently graduated collective Grande at the Salone Satellite questioning convention with their new project 6×6. This project explores how to make use of the waste generated when using marble, a material for which the design industry has had an excessive appetite in recent years. Grande say, ‘6×6 is a project optimising the physical properties of stone to get rid of traditional constraints. Inspired by wooden laminated panels, this material is designed as a sandwich of stones glued together and then cut into 6x6cm battens. This method significantly increases the rigidity of the rock by creating a new raw material. 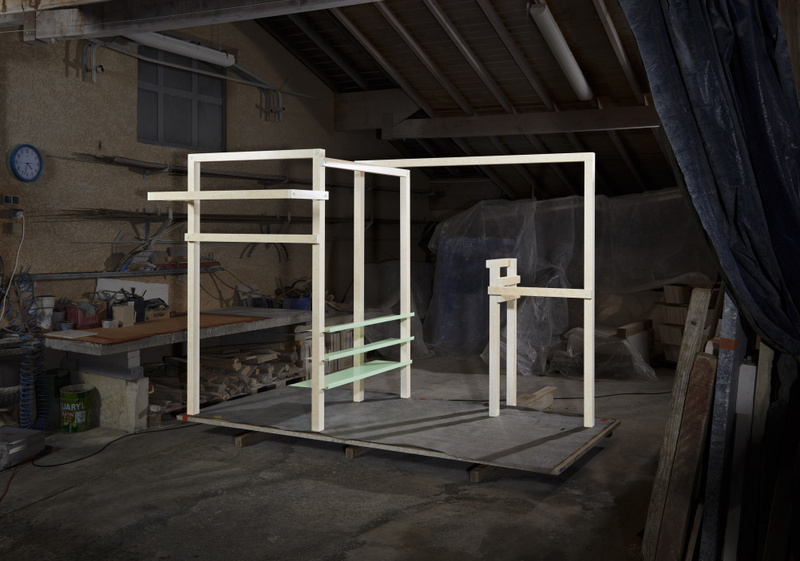 It then becomes possible to produce pieces of a much greater range and gives the opportunity to use the left-overs from this industry.’ To show off their new material the duo created a large-scale hanging rail with a beautiful Brutalist aesthetic, which could not have been achieve using traditional cuts of marble. Spending time with loved ones and nurturing our wellbeing have become important social themes in recent years as we reassess our value-systems in the wake of long-term global instability. With raised emphasis being placed on quality of life, the kitchen has taken on renewed significance as a healthy hearth to the home. 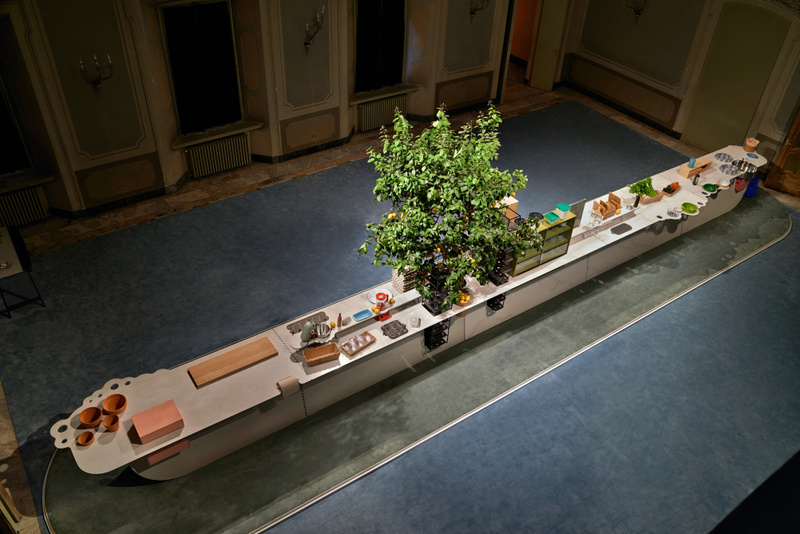 Offering just this was Raw-edges, who have created the concept Islands for Caesarstone. This playful piece focuses on the importance of enjoying food and its preparation. It reassesses the typical interior arrangements by elevating the worktop surface to hero. Cabinets and appliances are slotted into purpose-built voids rather than being placed atop or around it. 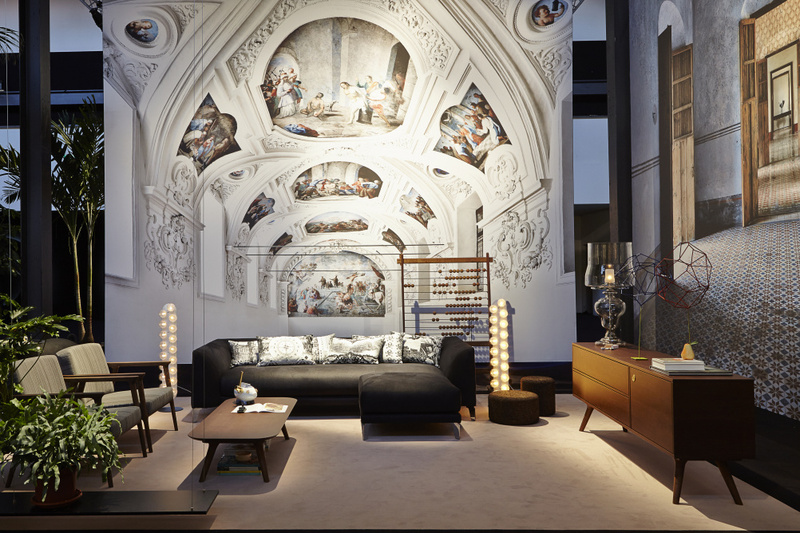 The piece created a wonderful contemporary contrast to Milan’s 18th century Palazzo Clerici where it was exhibited. We are living through a period of great flux, never before in human history has life shifted at such a fast pace. Amidst all the new at the Milan fair it was therefore a pleasure to visit Moooi’s show space, which had grounded its new collection in the past among the historical architectural photography of Massimo Listri. ‘In a world which is dominated by the new, we like to see our works in the context of eternity’, says the show’s co-creator Marcel Wanders. To achieve this feeling of timelessness, new pieces from designers (including Studio Job, Bertjan Pot, Kiki van Eijk and Joost van Bleiswijk) were arranged with older works from the Moooi collection into small room layouts. What particularly impressed us was the way the exhibition had turned 1,700m2 of show space into an exhibition that felt both impressively grand yet distinctly intimate. 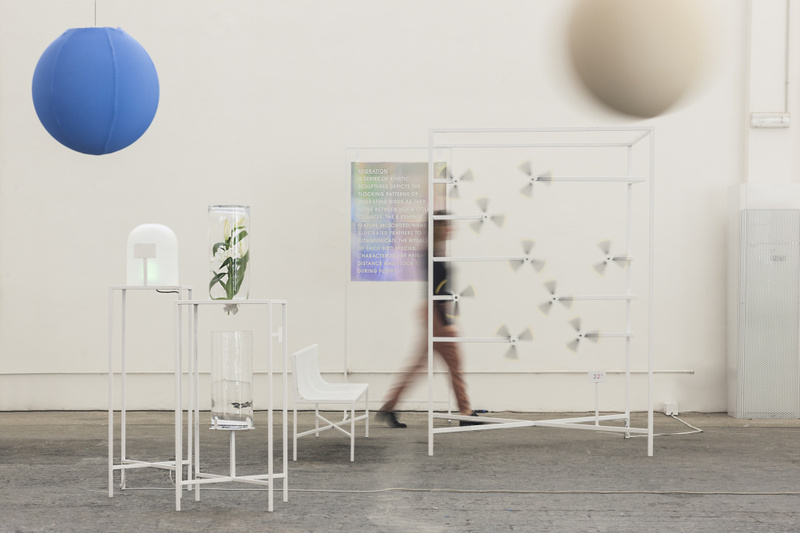 Another highlight from the fair responding to the acceleration of change was ‘De Natura Fossilium’ by Formafantasma, in collaboration with Gallery Libby Sellers. Its widespread acclaim demonstrated people’s growing desire for archaic and eternal materials as things become ever more ephemeral. Aiming to reference the concept of locality and the power of nature, the Italian design duo once again stood out with their innovative approach towards material exploration. 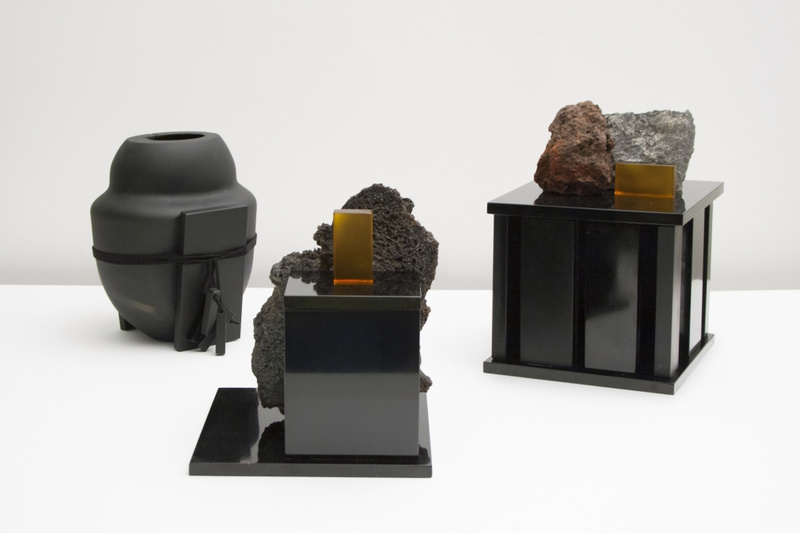 Inspired by the eruption of Mount Etna in November 2013, they started a holistic investigation into lava as a design material. The applications range from the familiar use of basalt stone to more extreme experiments with lava in the production of glass and the use of lavic fibers for textile. This stunning collection of stools, coffee tables, wall hangings and smaller assemblages embodied by contrasting geometric volumes use rough stone, basalt in varying levels of porosity and high-gloss glass in the deepest shade of black. The pieces beautifully highlight the multifaceted characteristics of this timeless material. As the Earth’s climate becomes increasingly volatile and society is striving to adapt, designers and artists alike are inspired by weather extremes. A beautiful example of this trend was the Hot & Cold exhibition by Fabrica in collaboration with Japanese air conditioning manufacturer Daikin. Taking temperature as a starting point, a series of multi-sensory installations invited visitors to participate in an immersive laboratory of hot and cold experiences. Highlights included kinetic sculptures of spinning feathers, evoking the seasonal migration of birds; an acoustic installation sampling the climatic sounds of Venus and Neptune, the hottest and coldest planets in our solar system; and tropical plants frozen in ice blocks, slowly melting in the warmth of Milan’s Spring sun. Set in a huge white space, the exhibits were accompanied by poetic and informative temperature facts printed on beautiful iridescent boards, all contributing to a wonderfully serene and calming display. Mariel Brown is associate director and head of trends, and Karen Rosenkranz is head of social and lifestyle foresight at Seymourpowell.